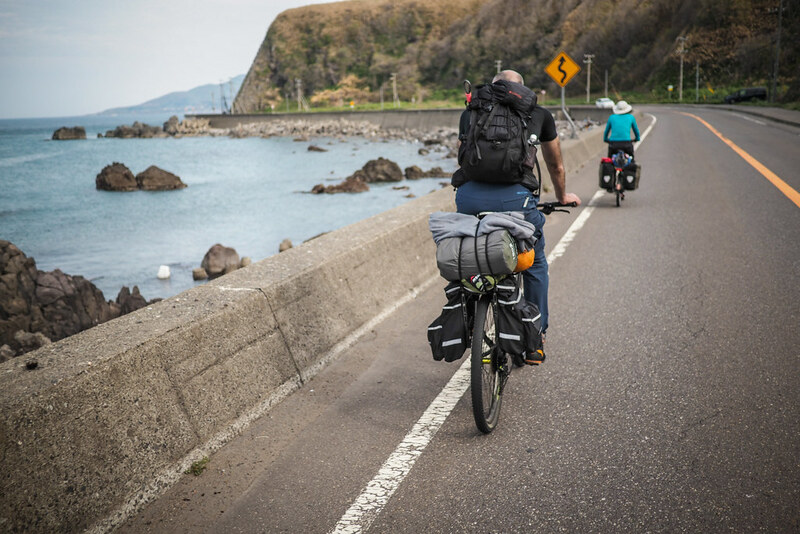 Gravel roads, pushing bikes through snow, and tough decisions…with our cycle touring team now three – counting the addition of Dirk – we set off this morning for what became the most adventurous day of this Golden Week ramble in southern Hokkaido. The day started out easy enough though: a gentle tailwind along the same placid Japan Sea coast we’d enjoyed the day before. Weather benign. 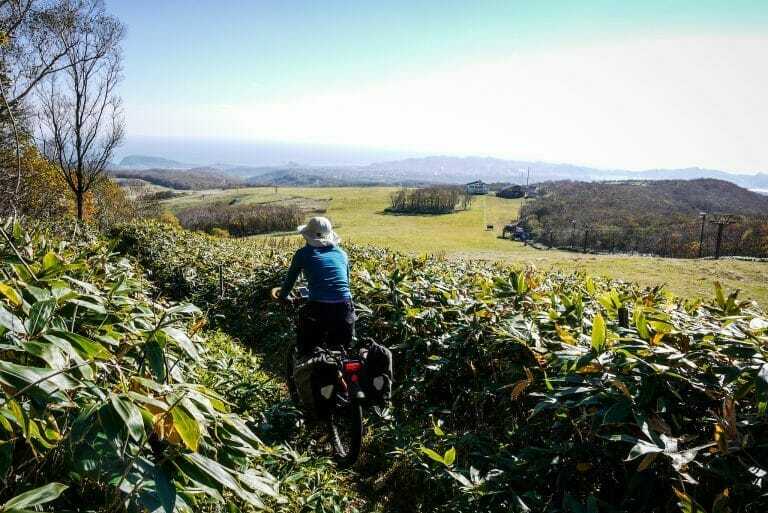 Even the small hump in the road between Taisei and Setana Town was nothing to write home about; a short and sharp uphill followed by a meandering long downhill race to where the fun would really begin. It was always the plan for today to be our ‘off-the-beaten-track’ day. 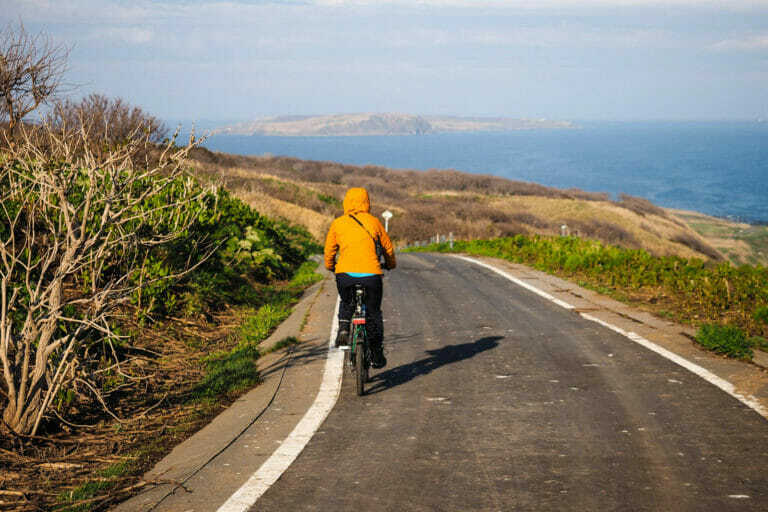 I had spied a very nice looking forestry road that linked Setana with Shimamaki on the northern coast of the Oshima Peninsula of southern Hokkaido. The route is marked as unconnected on Google maps, but the trusty Touring Mapple map book shows it connected by a gravel road over a high pass. The route runs north from Setana Town initially on route 345 along side Makomanai River, up to the Makomanai Dam. By all accounts, our probable success of crossing the pass on the dirt road was close to zero as we set off from Setana. At the hotspring hotel we’d visited the previous day I had asked the concierge about the route. 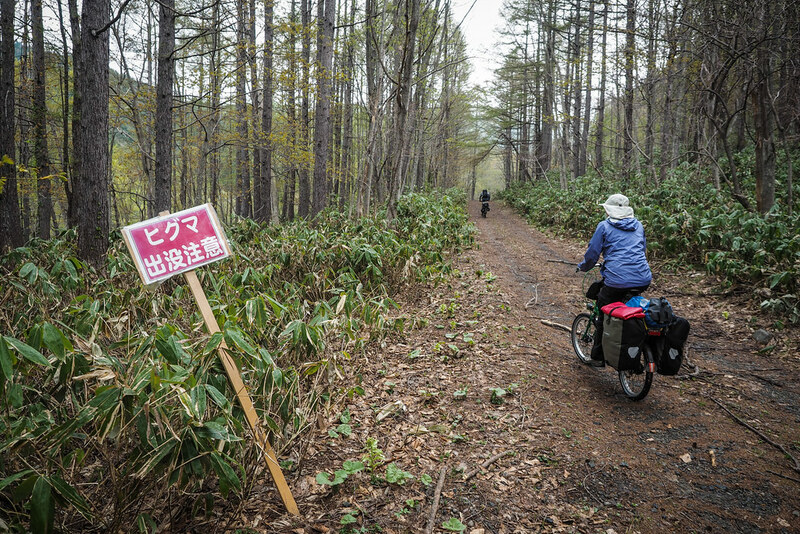 He was taken aback and said unequivocally that the road did not connect to Shimamaki in the north. “Perhaps there used to be a road over there, but there’s nothing there now,” he said with conviction. “Us locals, we call that area the bear’s nest. Two people were killed there last year. 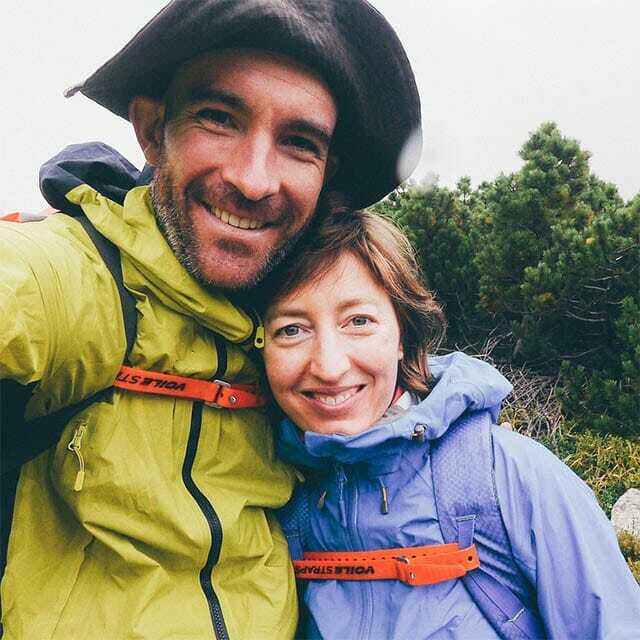 The police shot a bear up there last month, and they think they linked DNA from the bear to the bodies, but I still find the place spooky.” He seemed genuinely afraid of the woods we were proposing to penetrate with our bikes. I thanked him for his information, and said we’d take it into account. I was of course skeptical. 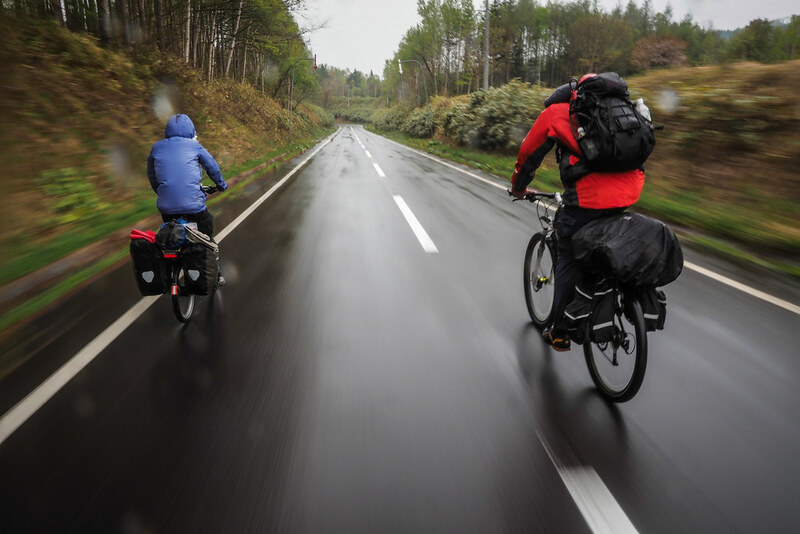 So often on my travels, locals, who could hardly imagine cycling across town, let alone across a mountain pass, would declare a route impassible, impractical, and sure to end in death and disaster. Not once had the advice held any merit. Upon arriving in Setana Town, however, we were starting to wonder if there was something more practical that might thwart our mission: snow. 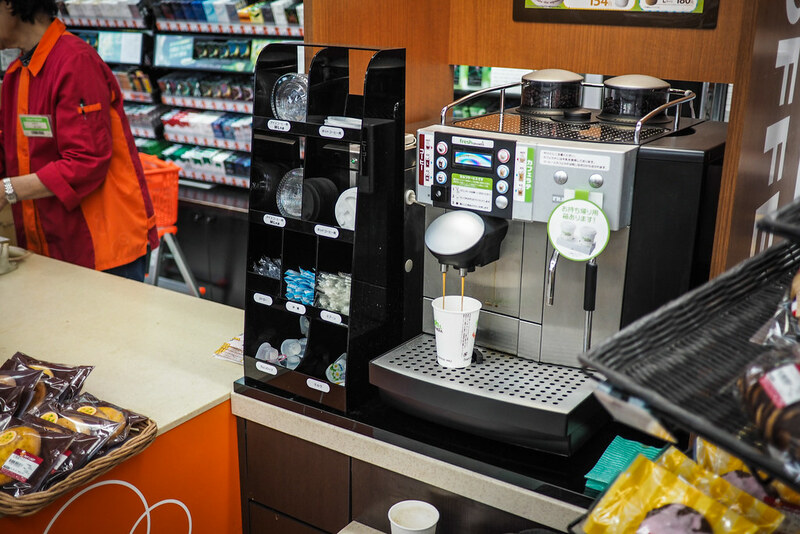 Dirk had pulled into the convenience store in town, and we followed suit, keen to get a hot cup of coffee and put on some more layers. The benign weather was turning cool, with threatening-looking rain clouds hovering over the mountains to the north. “So, did you bring your skis?” I quizzed Dirk jokingly. We consulted the map over our cups of coffee, and decided that it was unlikely the dirt-road pass would be much over 500 meters in altitude. 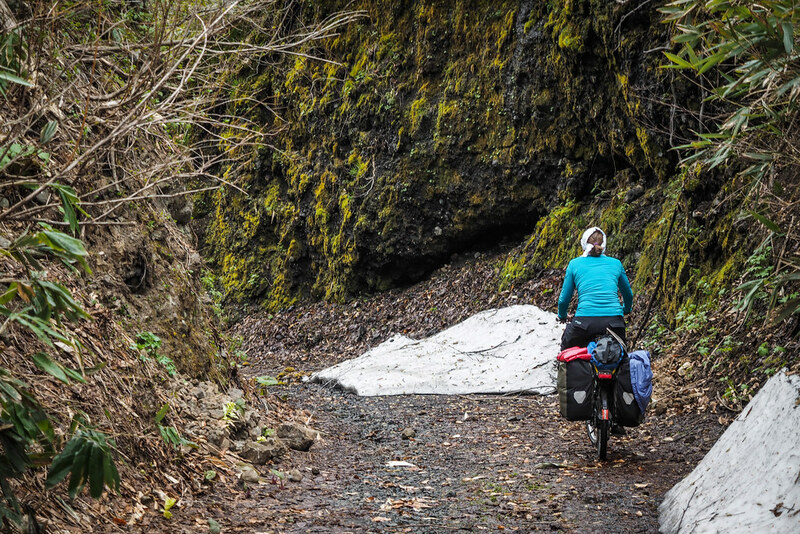 We would find out many days later that our guestimation was wildly inaccurate, but by our reckoning at the time, we might see some snow, but not enough to thwart our crossing. As we made our way up the valley, however, my confidence in our snow-free convictions was wavering. Before us stood what seemed to be one great wall of late spring-snow-bound hills, with no immediately apparent way through, the majestic Mt. Kariba rising to the west at a height of 1,520 meters. We were obviously heading to a deadend as far as automobiles were concerned; we essentially had the road – and glorious scenery – to ourselves. Lake Makomanai with its deep black waters seemed equal parts ominous and starkly beautiful. Below: The mighty Tern Verge S27h rearing for some dirt-road action. Bear-spray handy in the Alpkit feedbag attached to the handlebars. Before long we arrived at the locked gate which formed a border between smooth paved road and the start of the dirt road. Just as we were pushing our bikes around the gate, a small Suzuki 4WD drove up. Two couples of 60-somethings squeezed out, and wandered up to say hello. They were up here to search out springtime mountain vegetables: bamboo shoots and other edible shoots. I liked the guy already. There was nothing in his demeanor that suggested he considered us incapable of the task of cycling over the pass, had it been free of snow. I sensed a knowing appreciation of what we wanted to do; there was no attempt to turn us back right there and then. Still, I had my doubts. 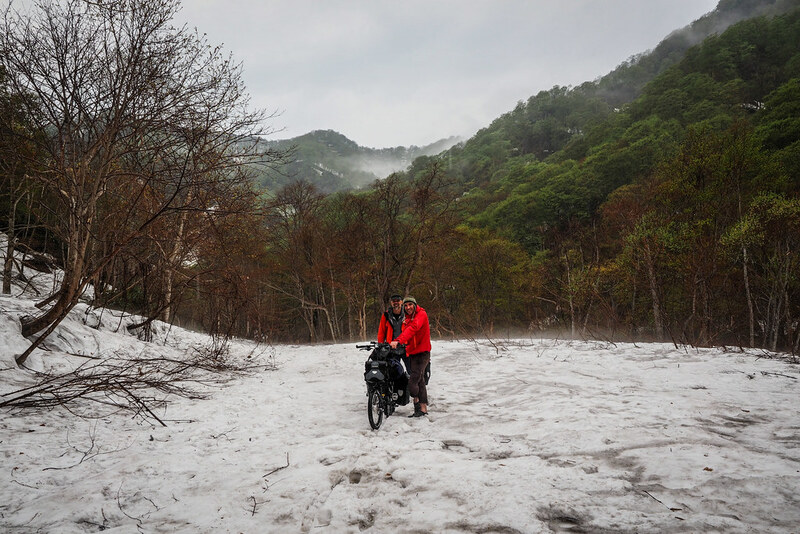 Perhaps, just perhaps, the road would be just snowy enough for snowmobiles, but not snowy enough to impede our progress on bikes entirely. I said we’d cycle up for a bit and see how things panned out. Once again I was impressed with his demeanor; him and his fellow foragers seemed almost happy that we’d take the time to explore up the road and find out for ourselves. “Have fun!” one of the old women called out to us as we set off up the road. Signs warned of bear activity, but none seemed up to date. 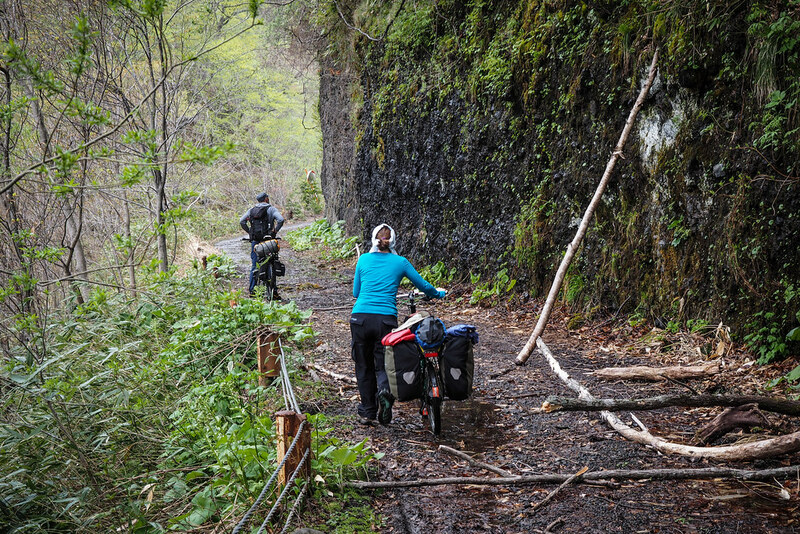 Nonetheless, Haidee kept up a reassuring stream of singing as she bumped her way along the branch-strewn track on her Bike Friday folding bike. The more we ascended up the valley, the more wild and spectacular the gorge became. The ancient road gripped the side of a tight valley with one of the most vicious rivers I’ve seen in Japan roaring down below. The sheer size of it was not what struck me so much as the volume of water that was pressuring its way past boulders the size of lorries…the kind of washing-machine whitewater that begs the viewer to imagine one’s grizzly fate should they find themselves at it’s mercy. It was not long before we hit our first patch of snow covering the road. Hardly worth writing home about, it was a 50m long stretch of lee-protected north-facing road, which soon gave way to clear road once again. We were at around 230 meters in altitude. Things took a more complicated turn at around 260 meters altitude. 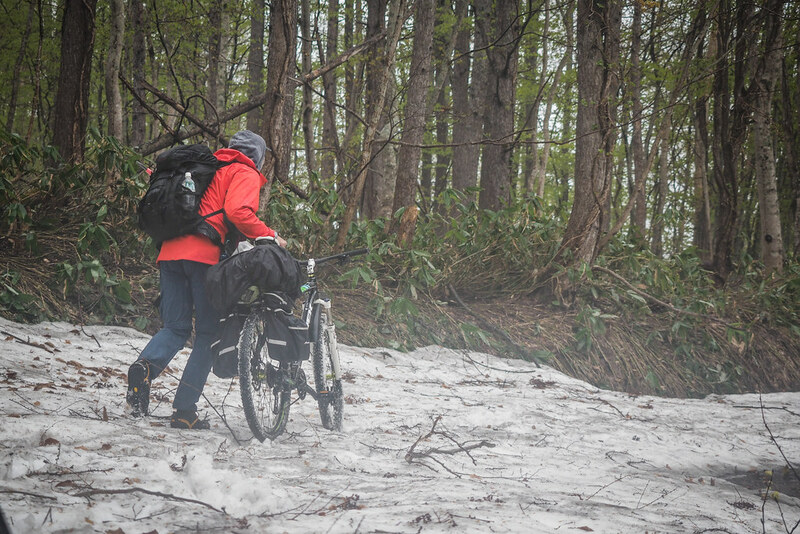 We were now primarily pushing the bikes across snow, that for the most part was hard enough to stand on without sinking in, but soft enough that Haidee’s & Rob’s 20-inch folding bike tires would dig in, making pushing very difficult. 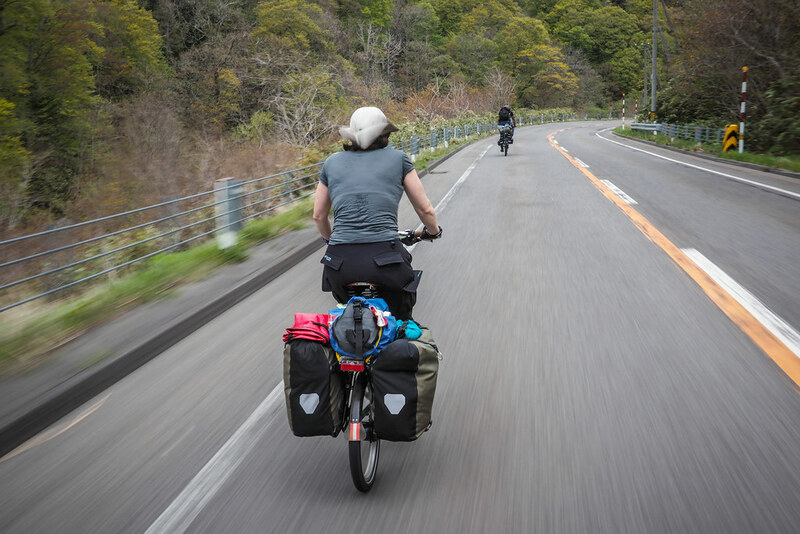 We were soon ferrying the folding bikes and luggage separately, effectively covering the same ground twice. 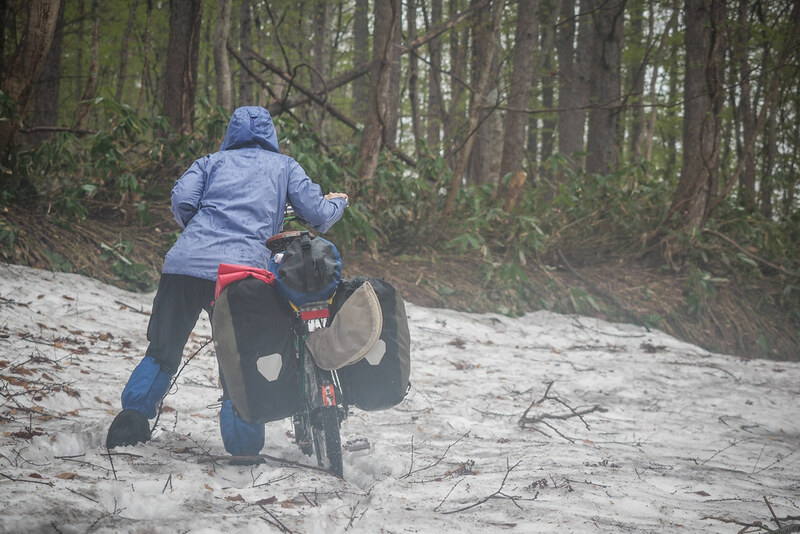 Dirk’s 29-inch wheel mountain bike carrying far less camping gear (I was carrying a coffee grinder for goodness sake) was naturally much easier going across the snow. Even despite (or perhaps because of) the excitement of dashing across recent rock-fall sections, we were in fairly good spirits. We had decided that even if we had to camp, we could do so. 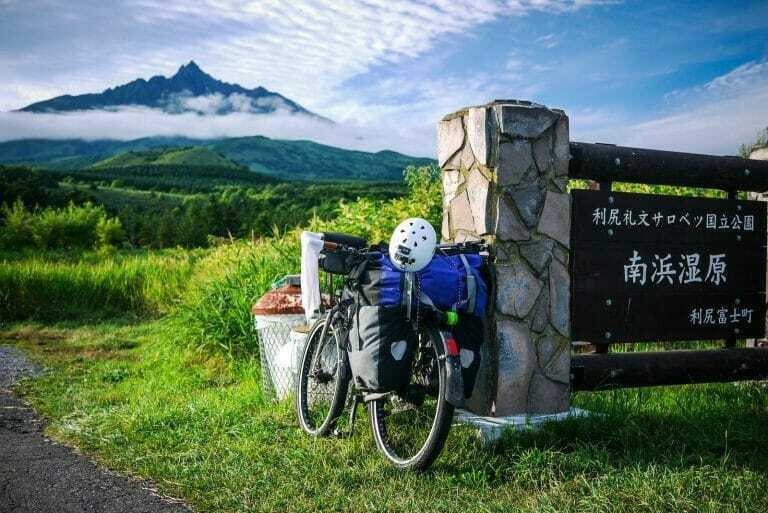 We had enough food, and because the pass was ‘only’ 500 meters high, if we pushed on we’d surely make most of the way today, camp, and then pop out over the top for the glorious downhill into Shimamaki, triumphant the next day. At just under 300 meters in altitude, however, we finally met our match. Up to this point, we had happily crossed patches of lee-blown slopes of snow, more or less covering the road. We’d achieved this because there was always a thin patch of clear ground on which to walk (see the photo above the last one). 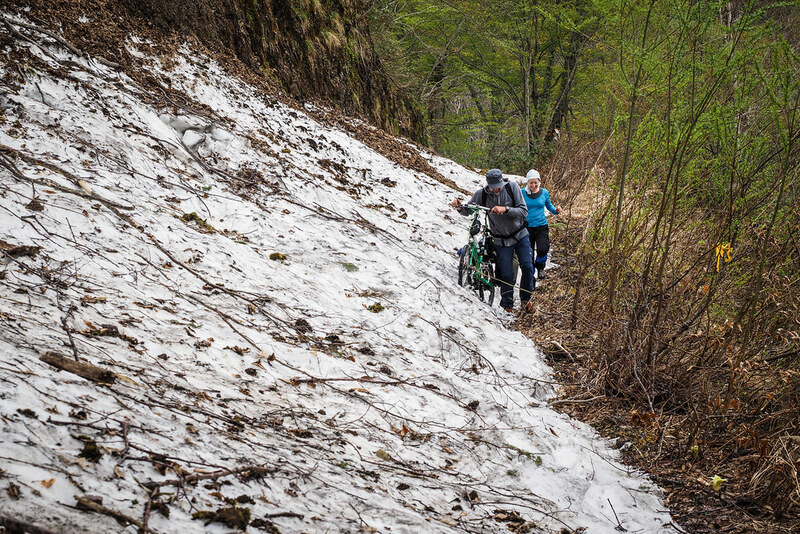 Here, however, we were faced with a wall of snow, creating a more or less perfect 45 degree slope to the precipice (dropping straight down to the roaring river in the gorge below). 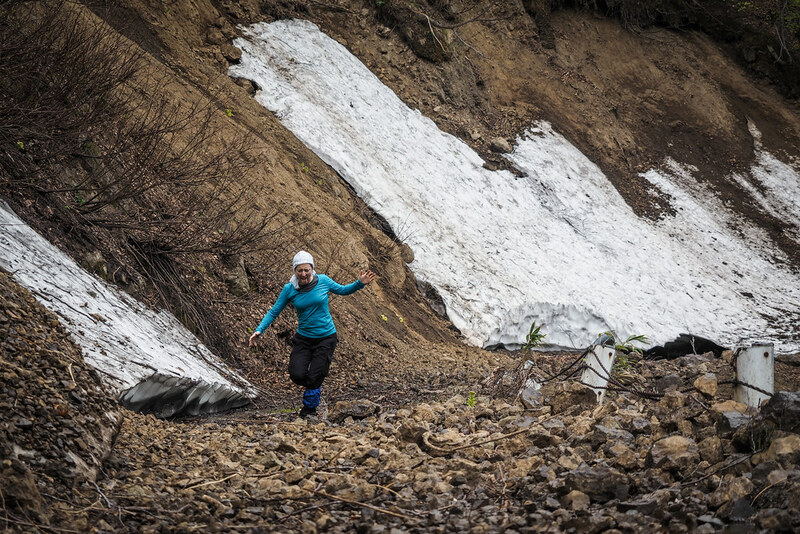 On foot with snowshoes and ice-axe, it would have been a no-brainer. With over-loaded bikes (i.e., my bike) it would have been foolish. We made the call to turn back. A first for me in all my cycle touring experience. Faced with obviously impossible odds of making it through with any modicum of safety, it was an easy decision to make. It was an easy enough task to console ourselves. This gorge – the Kumamodori Gorge (literally ‘bear return gorge’) – was easily one of the most spectacular I’ve seen in Hokkaido. 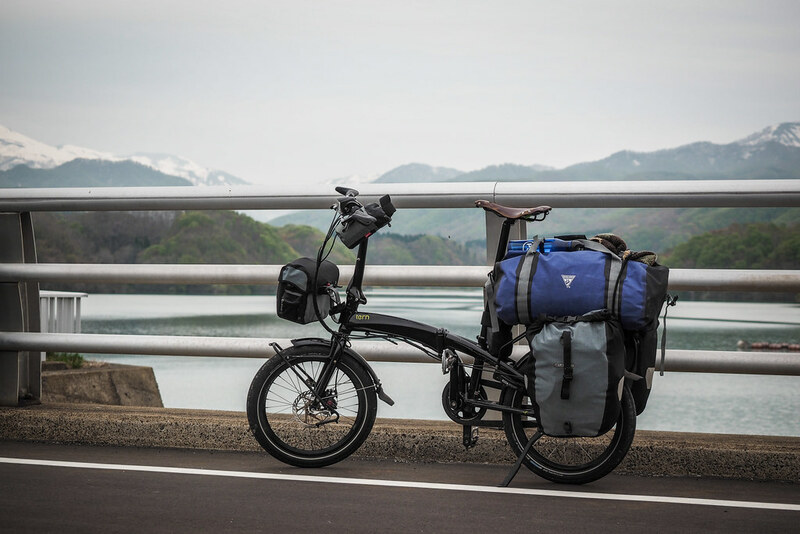 It pales in comparison to the scale of somewhere like Sounkyo Gorge east of Asahikawa, but the close, compact ferociousness of the river, coupled with the wildness of the road itself makes it rate very highly on my Hokkaido forestry road experiences. We vowed to return in summer. 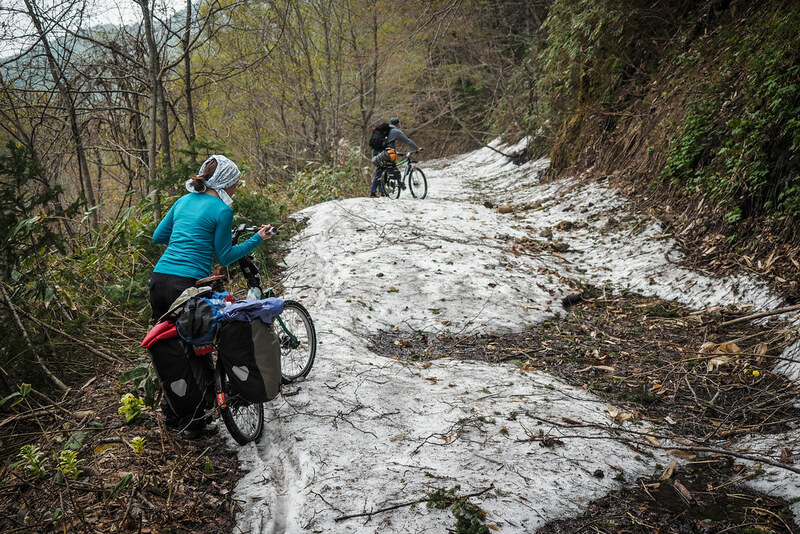 Naturally, to return the way we came meant heaving the bikes back across snow. This time, however, at least we were pushing downhill, rather than fighting both gravity and sinky snow. All the while, a light rain had started to fall. We were keen to get back to civilization to dry out and warm up. “All I want to do is to walk into a hot spring in a dressing gown, have a soak, and then go to bed to sleep,” said Dirk, speaking all of our minds. Hitting tarmac was like a dream. Heading downhill, it was effortless. Buttery smooth and fast. The contrast with the last four hours of effort could not have been clearer. Our first stop once we were out of the valley was the Kitahiyama Onsen – the local hot spring establishment in Setana Town. 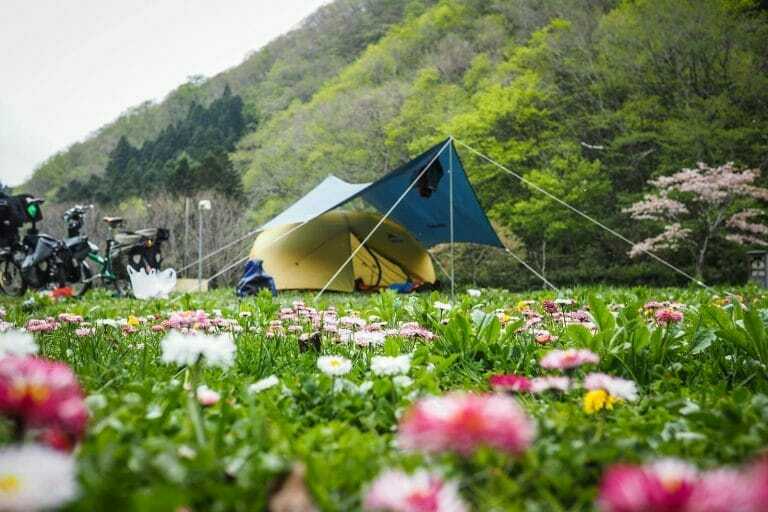 Upon seeing that a hotel was connected, it did not take much to convince all of us that the 5,800yen each per night (including hot spring entry) was a well-deserved reward for our efforts that day. Once we’d transferred all our gear inside, the first stop was a long soak in the hot spring baths. And in true Japanese hotspring hotel fashion, our fantasizing on that snowy mountain road came true: we all sauntered through the hotel to the hotspring area wearing hotel-issued yukata – Japanese-style kimono commonly worn in hot spring resorts…essentially the dressing gowns we had dreamed of. Great site, thanks for the free resources! Have used your routes over the last few weeks and found them very helpful. 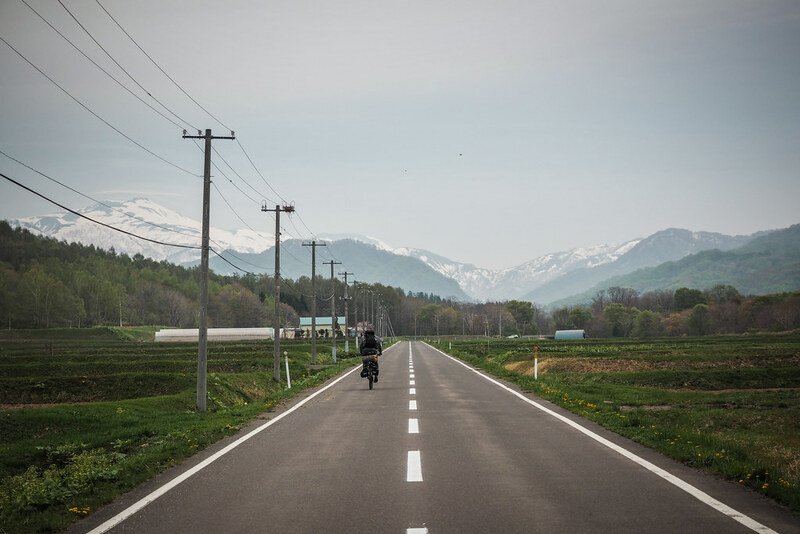 Especially the route from new chitose to Sapporo (the long way, to enjoy the bike paths). We also tried the off-road path from garonataki to setana. It took us over five hours with much hike a bike (a couple of small landslides) but it was the jungle that slowed us to a stop. I too performed my first about-face after being stopped completely, only a few hundred metres short of the river crossing. Perhaps if one returned with machetes to clear the jungle and many provisions, it may be passable, or there may be bigger landslides as one local suggested to us. We did not see any bears though there were very fresh and old scats around (we had bells and loud singing voices). A person did sight a bear and cubs only a few kilomteres from the garonataki camp-site, which is free and gorgeous. Thank you for the important notes! What an adventure you had, wow!!! Can just image all the laughter, maybe slightly nervous at times, smile, as you continue ahead although uncertain what the outcome is going to be… Great day you had indeed!